West Ham XI: Adrian, Jenkinson, Tomkins, Collins, Cresswell, Kouyate, Noble, Lanzini, Payet, Moses, Sakho. The Hammers move up to third for the time being. Alan Pardew's Crystal Palace can be proud of their achievements. This scoreline isn't a fair reflection of the game. Ol' Manuel Lanzini plays a through-ball for Dimitri Payet who dinks his effort over the reach of Wayne Hennessey. We are deep into stoppage time here. West Ham certainly did leave this late - they all count though, I suppose. Heartbreak for manager Alan Pardew and his 10-man Palace side. Mauro Zarate delivers to the back post where he finds Andy Carroll who cushions his header into the path of Manuel Lanzini who slams home. Nikica Jelavic comes on for Diafra Sakho. By the way West Ham, why have you given up on trying to make the most of having a man advantage? Why? The visitors have barely troubled the home side in the last 10 minutes. Palace goalscorer Yohan Cabaye is replaced by the Welsh "Beard that is Feared" Joe Ledley. Again the free-kick comes to nothing, but West Ham have a corner - before that is taken Mauro Zarate replaces Victor Moses. Anyway, back to the corner. The delivery is cleared to the feet of Andy Carroll who fires high and wide from 25 yards - he's not really a 25-yarder type is he? West Ham are very much going for the jugular with a grip that is tightening. But Palace are showing their defensive qualities. The Hammers are a free-kick on the right though. Palace's Mile Jedinak goes into the book for a foul on Victor Moses. Scythed down. Palace are looking more tired as the game moves into the final phase. The Hammers have a corner and 6ft-something Andy Carroll is lurking. However, the big man fails to get a good contact with the delivery. So, so close. West Ham's Diafra Sakho climbs brilliantly to meet a cross from the right, but his headed effort comes off the post. West Ham bring Mark Noble off and bring on Andy Carroll - as predicted. Palace take off James McArthur and bring on Mile Jedinak. Palace continue to look dangerous - the thing is even though they are down to 10 men they have such pace on the break that it's not too much of a handicap for them. I can see Alan Pardew's side scoring. West Ham striker Andy Carroll has the hi-vis training jacket on and he's standing up doing that rotating thing with his hips - is he coming on soon? Defender James Collins appears to be struggling for West Ham - I think he's taken one in the ribs. I know the feeling. I fractured a rib playing in goal once. The pain when you laugh or sneeze.... the pain!! It's a free-kick to Crystal Palace, but it comes to nothing as the Hammers clear the low delivery from the six-yard area. At least the home team playing with 10 men are looking for the win. It was probably just about a second yellow to be fair Joel. Who wants to see a pretty graphic of Carl Jenkinson's goal? He's number 12 by the way. He appeared as if by magic. Ten-man Palace take off Wilfried Zaha and replace him with Bakary Sako. Not exactly a defensive change. There have already been 12 goals scored in the six 15:00 BST Premier League games. Check out the main Premier League live text commentary to see where the goals went in (and how they've affected your fantasy team). Fancy predicting how this will finish? I thought not. "It's soft. Dwight Gayle caught him but I actually think he is trying to stop before he gets to the player and slips. I don't think there is any malice in there at all, it's unfortunate. He knows he's not going to reach the ball. I don't think it's a red." I told you earlier that I sensed a red card and that Dwight Gayle was a little bit feisty. By my maths... possible red + feisty Dwight Gayle = red card for Dwight Gayle. The Palace forward caught the foot of Cheikhou Kouyate and paid the price - a second yellow from Mark Clattenburg. West Ham's Dmitri Payet has a "'ave it" moment by kicking the ball away after conceding a foul. He goes into the book. Standard. Dwight Gayle is very feisty today. West Ham keeper Adrian was shielding the ball as it was going out of play, and the Palace man appeared to have a wee nudge, which the Spaniard did not look too pleased about. Palace striker Dwight Gayle, who has had an eventful last few minutes, goes into the book after pulling down Dimitri Payet. I sense a red card in this one. "For the retaken penalty Dwight Gayle was two yards in the box the first time and only a little bit inside on the second. The pressure was on Yohan Cabaye but he stepped up again. Great bottle. "Carl Jenkinson controlled the ball so quickly for his goal that the goalkeeper had no chance to set himself, it was such a good finish too." "It was lovely, a striker's finish from Jenkinson. It was like watching Michael Owen!" Yohan Cabaye scores!! No!!!!!!! Dwight Gayle encroached in the area and ref Mark Clattenburg has asked the Frenchman to take the spot-kick again. Will he find the net again? Oh yes he does. Cool as you like by the ex-Newcastle midfielder. It's all square. And breathe. Cripes! Hero to zero. Carl Jenkinson pulls down Dwight Gayle in the area. It's Yohan Cabaye to take the penalty. What a two minutes!! The Hammers have the lead! Victor Moses plays a lovely weighted pass for full-back Carl Jenkinson who slyly makes his way round the outside on the right and into the area before poking in. Never thought a goal would come in the first half. A corner is swung in from the left and arrives at the head of James Tomkins who fails to get a good connection at the far stick. Moments later, the defender is shown a yellow after bringing down Dwight Gayle. The free-kick came to nothing. Dimitri Payet and defender Aaron Cresswell stand over the ball, surely it must be Payet? No it's Cresswell, who sends his free-kick high, wide and not very handsome over the bar. The Hammers have a free-kick about 25 yards from goal - dead centre. By the way, while we have a mini lull in play, let me point you to the main Premier League live text commentary - we've had a couple of goal already - in one game. Arguably West Ham's player of the season so far, Dimitri Payet, has another effort on goal - a low shot from 15 yards that is comfortably collected low down at his near post by Wayne Hennessey. Palace have their first effort on goal. Dwight Gayle sets up Jason Puncheon whose angled drive from 12 yards drifts wide - almost out for a throw-in. The home side are yet to settle. Argentina international Lanzini, 22, looks very lively down the left. It looks like the Hammers will try to release him down that wing as often as possible. West Ham almost take the lead inside the first minute. Manuel Lanzini bursts down the left and plays a low ball across the area which Dimitri Payet only manages to toe wide. Crystal Palace get the match under way. The players are in the tunnel. There's early millennium house music blasting out inside the stadium. We are four minutes from kick-off. Remember tropical Croydon at the start of the season? It's parkers and padded jackets at Selhurst Park today. The dance troupe The Crystals are doing their best to put on their best brave faces on the pitch as they entertain the crowd. Hammers bossSlaven Bilicis hoping to stop Palace from picking up their third successive league win - he has forwards Enner Valencia and Andy Carrolltobring on after they were both named on the bench. Ecuadorian Valencia has been sidelined since suffering a knee injury in a Europa League qualifying tie in July, while Carroll is available after shaking off a knock. Carroll has been blighted by injuries since joining West Ham on a permanent £15m deal in 2013. "I heard about that before, that sometimes he got injured because he was not totally dedicated to being a footballer," said Bilic. "From my first day, he was injured. But the way he was working - in six to eight weeks of struggle that was boring and not ideal and not fun - he did it as a great professional and now we are expecting big benefits out of that." OK Palace and West Ham fans, how much have you paid to watch this game? How much do you pay for tickets over the season? If only there was a Price of Football calculator available to help you work it all out... well there is. The BBC Sport Predictor game pits fans of Premier League clubs against each other - and West Ham supporters (second) are ahead of their Crystal Palace counterparts (fifth) in our table at the moment. Crystal Palace name an unchanged XI from the one that started in the 2-0 win over West Brom. Damien Delaney and Mile Jedinak return to the bench. Enner Valencia is on the bench for West Ham having been sidelined since suffering a knee injury in a Europa League qualifying tie in July, while fellow forward Carroll is also a substitute after shaking off a knock. Diafra Sakho starts up front for the Hammers. Dreaming of England?Image caption: Dreaming of England? There. I've said it. He's mentioned it this week too, in a very roundabout way. Quote Message: I haven’t brought it up once, I don’t want to talk about it today, it’s not on my agenda and I'm quite happy at Crystal Palace. But it’s the England job. If you’re English and don’t want it then there must be something wrong with you. I haven’t brought it up once, I don’t want to talk about it today, it’s not on my agenda and I'm quite happy at Crystal Palace. But it’s the England job. If you’re English and don’t want it then there must be something wrong with you. Or perhaps sanity warns some against taking up the position. But I digress from Pardew's achievement at Palace which must surely make him a contender for the England role when Roy Hodgson vacates the position. 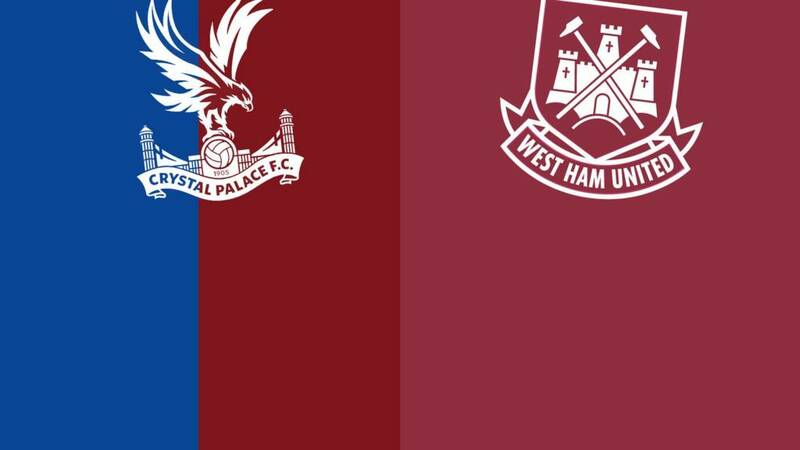 The Eagles are a remarkable fourth in the table and face sixth-place London rivals West Ham, who themselves have made a superb start to the season.